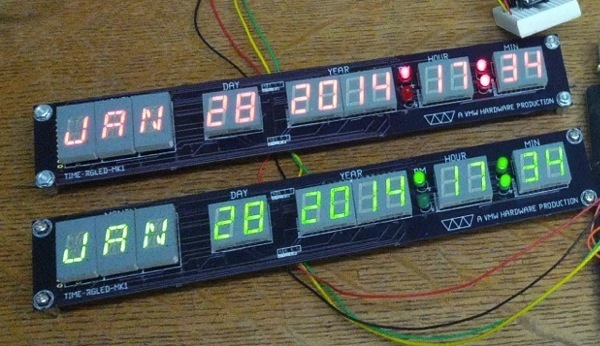 From the Forums: LED Time Circuits from “Back to the Future” « Adafruit Industries – Makers, hackers, artists, designers and engineers! I know it’s a common project, but I thought I’d make my own Raspberry-Pi powered Time Circuits, looking similar to those seen in the Back to the Future movies. The goal is to have three calendar/clock displays (red/green/yellow) that you can set via a keypad. The displays will each have 3 16-segment alphanumeric displays for the month, then 7-segment displays for date/year/hour/minute. The Raspberry-Pi controls the display over i2c. Using the Pi running Linux is a bit of overkill, as any board that can keep time and drive an i2c bus could run things. The display is run by a series of HT16K33 chips (I use the breakout boards from adafruit). Each chip can run up to 16×8 LEDs plus read a keypad matrix. For the displays I use Kingbright common-cathode LED displays. I ended up buying direct from them as it was hard to source red, green, and yellow displays of both 7-segment and 16-segment types all from the same place. In the end the yellow 16-seg are of type PSC05-12 and the red and green are of type PSC05-11 and the pinouts are not compatible. This is unfortunate because it means I’ll need separate PCB layouts…. The displays will not match the version seen in the movie exactly. There are some good reasons for that ( the month names as displayed in the movies aren’t possible with off-the-shelf LED displays). Also I like to think Doc Brown himself was a bit of a hacker (although a bit of a perfectionist) and thus any rebuild he did would vary as he thought up improvements….